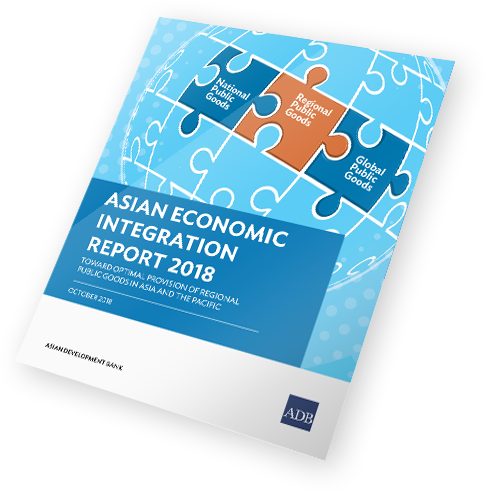 This publication is the annual report of the Asian Development Bank (ADB) on Asia’s progress in regional cooperation and integration. 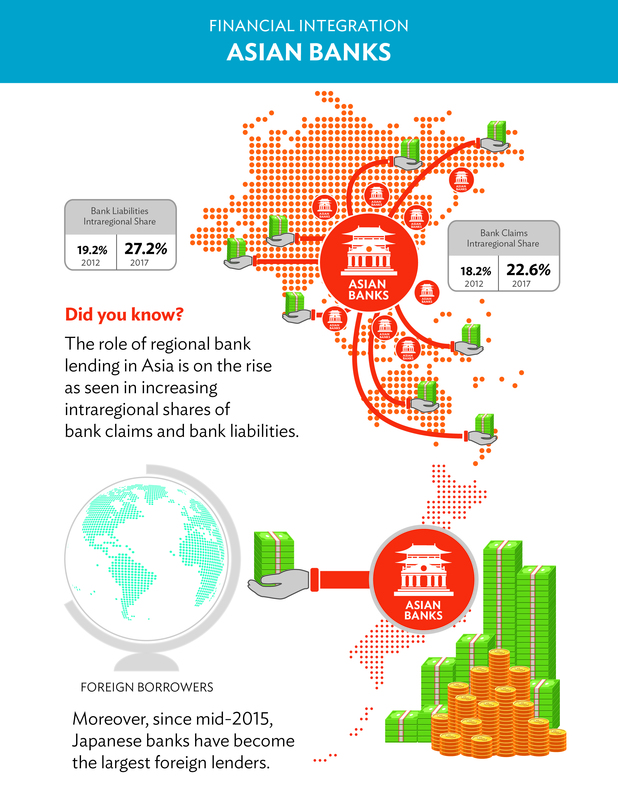 It covers ADB’s 48 regional members and analyzes regional and global economic linkages. This year’s special chapter, “Toward Optimal Provision of Regional Public Goods in Asia and the Pacific,” examines how collective action among countries can help find solutions to growing transnational development challenges. It discusses how to best provide regional public goods (RPGs) that transcend the so-called “collective action problem,” which occurs when individual interests are too weak on their own to drive cooperation on common issues. The chapter suggests that multilateral development banks should act as honest broker in enhancing mutual trust and facilitating regional cooperation for RPGs. The Asia and Pacific region maintains healthy economic growth outlook. 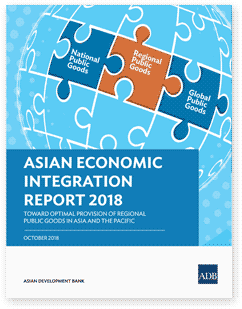 The Asia-Pacific Regional Cooperation and Integration Index shows that infrastructure and connectivity are the key drivers of regional integration in Asia. Asia continues to lead a recovery in global trade. Asia’s trade integration remained strong, providing the region a shield from potential headwinds. Despite a slowdown in inward FDI to Asia, intraregional FDI continues to rise. Global outward FDI decreased 2.9% in 2017, primarily due to a drop in FDI from developed economies; outward investment from Asia weakened only 1.4%. 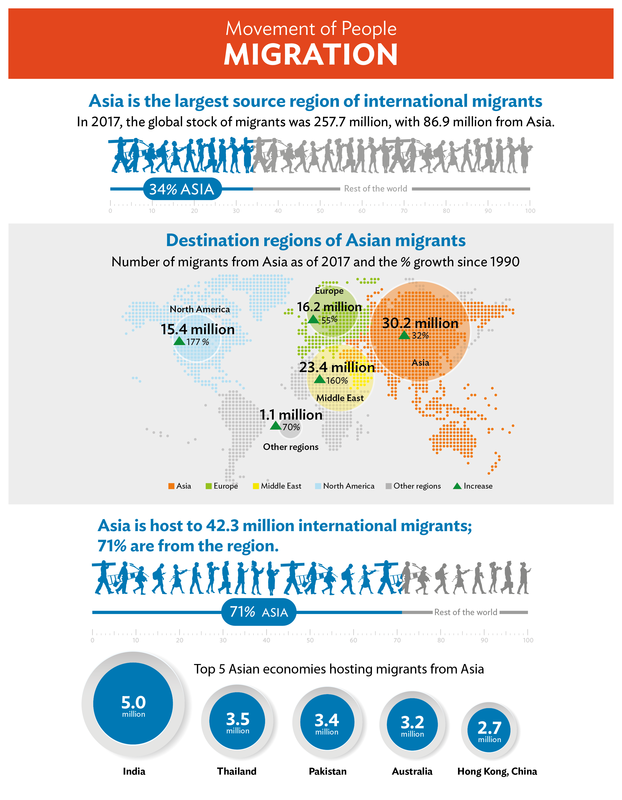 Asia remains the largest source of international migrants. 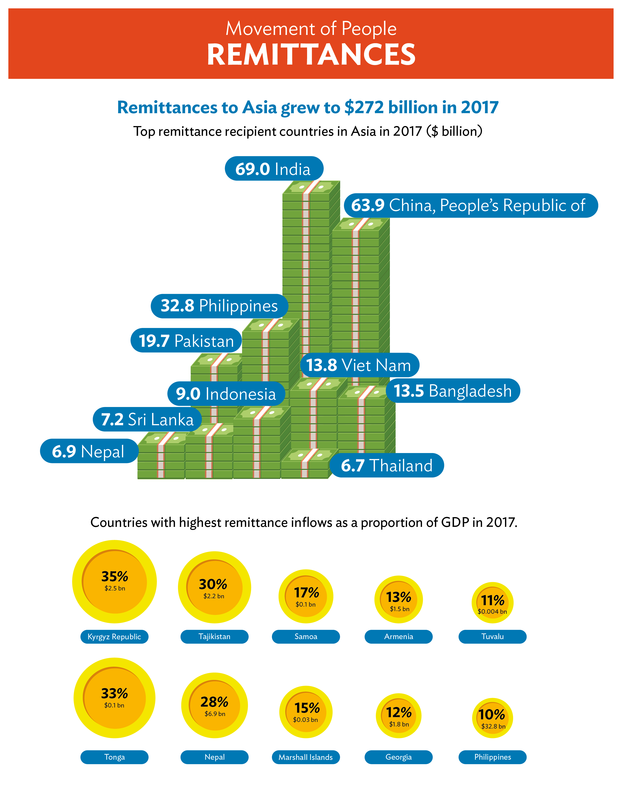 A record $275.5 billion in remittances were channeled to Asia in 2017. Tourism is the main source of income for many economies in the Pacific and Southeast Asia. Intraregional tourism continues to expand but a growing share of Asian tourists is heading to non-Asian destinations. Asia’s local bond and equity returns have become more sensitive to global shocks since the US monetary policy normalization began. 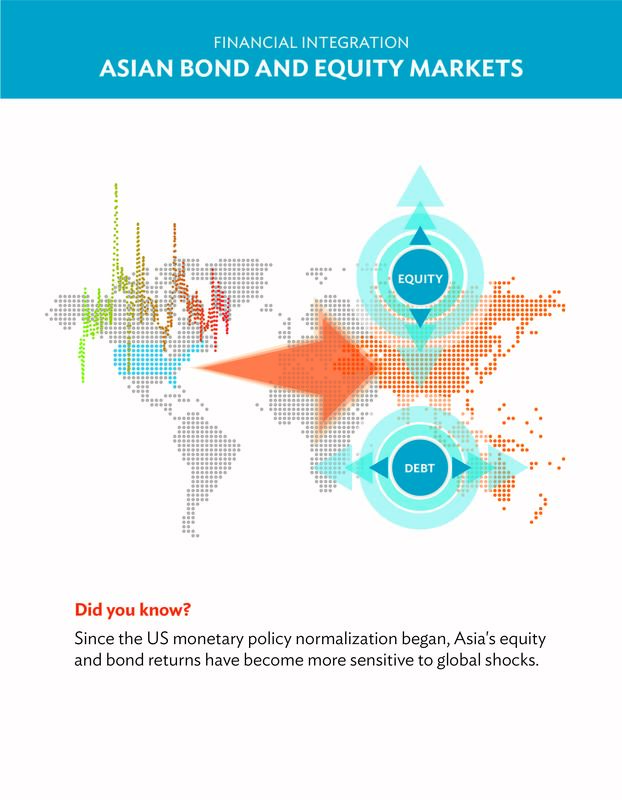 Increasing sensitivity to global shocks highlights Asia’s strong global links and reflects uncertainties surrounding the changes in global financial conditions. Multilateral development banks can help increase regional public goods via knowledge generation, financing, enhancing mutual trust, and facilitating regional cooperation for the provision of regional public goods. More effort is needed in measuring spillover benefits of regional public goods and identifying potential beneficiary countries. Asia's financial linkages with the rest of the world remain strong. Domestic policies outside Asia are tied to Asia's financial markets. Amidst the increasing trend in Asia's intraregional bank integration, Japan has been the largest foreign lender since mid-2015. The growth in Asia’s cross-border assets and liabilities was driven by a surge in equity investment, boosted by global liquidity, favorable economic conditions, and investors’ appetite for positive equity returns. Migration from Asia to outside regions is on the rise but intraregional migration remains significant. Remittances to Asia are increasing once again, with major boost from the Middle East and North America. Theme Chapter: "The Era of Financial Interconnectedness: How Can Asia Strengthen Financial Resilience?" Special Theme: What Drives Foreign Direct Investment in Asia and the Pacific? Special Chapter: How Can Special Economic Zones Catalyze Economic Development? Asian Economic Integration Monitor (AEIM). Click here to see archived content.